So Seattle is by far a hub for architecture and design. From the EMP,Central Library,to local artists, enviromentalists, etc.So this coming weekend for two days food, design and art will collaborate for an evening of fun at Martyr Sauce Gallery.in celebration of the Seattle Design Festival. 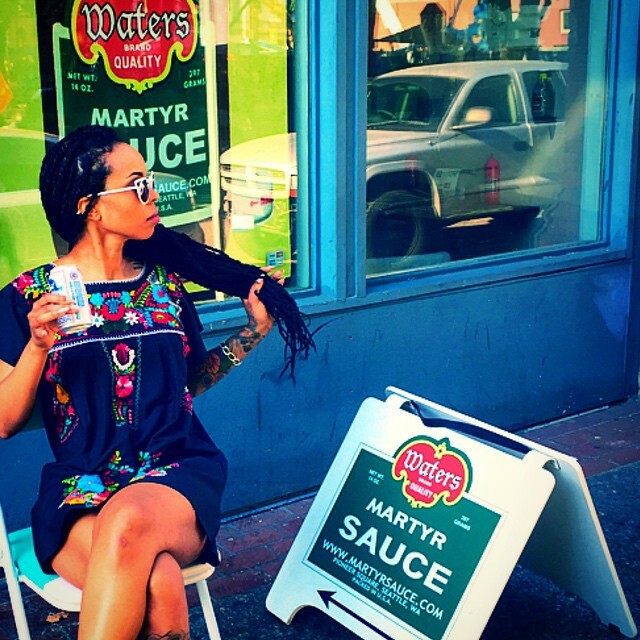 Tariqa Waters has lived in and worked in Wasington D.C.,Sicily, and Atlanta before relocating with her family to Seattle in 2012. Curator-turned-designer, Erika Dalya Massaquoi will showing vintage West African textiles from her nascent ready-to-wear line, The Oula Company. Oula’s colorful West African and Indian textiles will be “upcycled” into a beautifully crafted quilt and exhibited at Martyr Sauce. Massaquoi received a doctorate in cinema studies at New York University and held positions in the School of Art and Design at the Fashion Institute of Technology and at the Whitney Museum of American Art in New York before relocating to Seattle and establishing Oula in 2014. “Disguise,” an exhibit on traditional masks and contemporary African art that Massaquoi co-curated for the Seattle Art Museum, is on view through Sept. 7. So the three of us are collaborating for an amazing event of food,art,music and fun!See yall there!